This 18-hole, par-63 golf course is a mid-length gem situated in the heart and soul of the wine country of the Okanagan. Its central Kelowna location makes it easily accessible from nearly every location of Kelowna, offering a BCGA-rated golf course for every Kelowna golf lover to enjoy. Viable for both the pro and beginner golfer, Michaelbrook golf course is specifically designed with wide open fairways, rough with water hazards at four holes, and an 18th hole green island to encourage a challenging yet accessible course. Golfers can opt for a shorter game of golf by choosing the 9-hole course, which takes about 80 minutes to complete, or they can go for the full 18-hole course, which runs roughly 3 hours and 20 minutes. With 3,800 yards of rolling greens, tree-lined fairways, long flowerbeds, and water hazards, as well as an optional island green, every golfer is sure to find paradise at Michaelbrook. 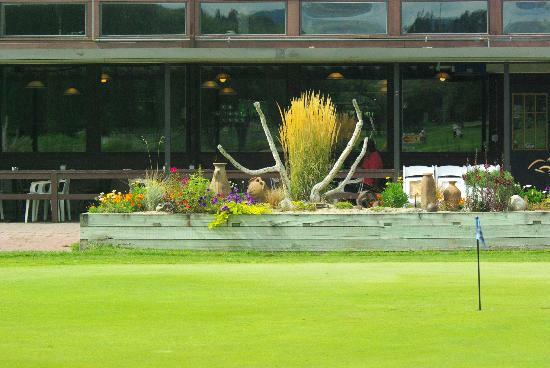 The affordability and convenience of the Michaelbrook Ranch Golf Course make it a favourite for many Kelowna locals, and the course has been an integral part of the Okanagan golf community since it first opened in 1989. The course is open to all guests and is very accommodating to year-round members. The club also makes equipment rentals easily accessible. The season at Michaelbrook runs from March 1 to October 31. Once members and guests feel they're ready to take their skills to the next level, they can arrange their own tournaments and group game of golf. Group rates are available for a group of at least 24 people, ranging from $24 to $36 for either a 9- or 18-hole game. Golf club rentals are 10 to 14 dollars, and 10-game passes range from $240 to $380, depending on the age of the golfer and the length of the game. The clubhouse at Michaelbrook has recently undergone renovations and now offers a modern, comfortable, and aesthetically-pleasing atmosphere that can be utilized for special events of up to 168 people. The affordability and convenient location of the golf course make the clubhouse here a very practical solution for your special events like a birthday or anniversary. Open daily from 11 AM to 9 PM, Brook Bar and Grill is the on-site restaurant that makes it convenient for members and guests to enjoy a cold beverage after a round of golf. The menu is packed with delicious, casual, and international dining options, each with a west coast twist. The breakfast menu, which offers traditional menu items like omelettes and eggs Benedict, is available on weekends until 2 PM and on weekdays until 11 AM. The Pro Shop at Michaelbrook offers everything you'll need to fully enjoy your day of golfing, from golf equipment to apparel to footwear. The shop is open seven days a week and caters to both men and women with professional lines like FootJoy. In order to maintain the high-end atmosphere, you'll find at Michaelbrook Ranch Golf Course, a dress code is in place and requires a proper golf shirt and golf attire to be worn at all times. With its well-renowned services and amenities that are paired with its upscale BCGA rated course, MichaelBrook Golf Club was nominated by locals in 2018 for the Best of Kelowna award, which is an annual city-based award system to name the "bests" of the city in over 80 categories. Being nominated for this title is surely a reflection of the great experiences had here by the many local golfers and a strong indication of Michaelbrook's strong local reputation. Michaelbrook has also been deemed a premier golf course for tournaments in the Okanagan Valley, offering a capacity of up to 144 golfers. Michaelbrook is arguably the most satisfying and convenient Kelowna golf course in the central part of the city, and one that will certainly remind you of your love for the game. It’s just one additional benefit to living in the area, so you're certain to add the Lower Mission to your list of possible neighbourhoods, especially after a visit to Michaelbrook Ranch Golf Course. If you're interested in gaining more insight on living in Kelowna, as well as information on the Kelowna real estate market, visit our blog.